What Did I Say I Did? You Read it on the Internet, so it Must be True! Anyone who knows me, knows I am quite the stickler for clarity and correctness in communication. 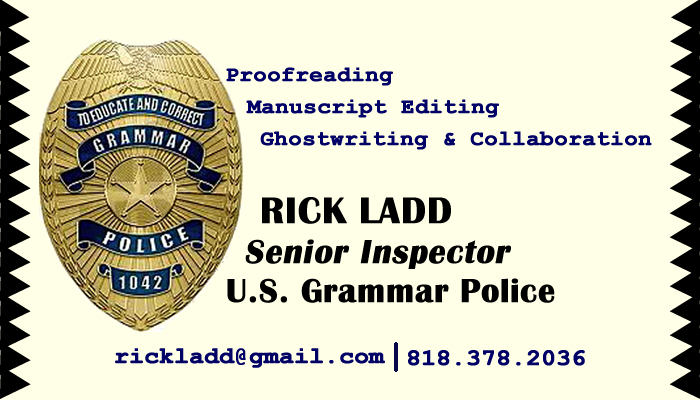 I have proudly held myself out as a Senior Inspector in the U.S. Grammar Police, as evidenced by this card I created only halfway in jest. Actually, the card’s creation (I shared the process publicly) led to a couple of paid editing gigs. I’ve also been called a Grammar Nazi, which has caused me to momentarily flash a slightly sheepish smile, accompanied by a sparklingly demure blush. Recently, I began a new engagement with a company I’ve wanted to work with for some time, Quantellia, LLC. As of the beginning of the year, I am what they call a referral partner. As such, I am contracted to Quantellia to sell their product, World Modeler™, and their services, which include training, workshops, etc. designed to help organizations make better decisions. In learning about my new venture, I have come across a few phrases that are similar, yet different enough to cause me to dig a little deeper in search of clarity as to their meaning. I want to very briefly share my understanding of the meaning of four separate phrases, each of which begins with the word “decision”. At first, I thought one of the terms was kind of a catch-all; an umbrella term that encompassed the others. However, I no longer believe that to be the case, at least not fully. Keep in mind, all four of these phrases are relevant to what it is Quantellia and I are doing. At the same time, my understanding is quite likely imperfect and incomplete. As I gain a foothold in the discipline, and become more proficient, I have no doubt my definitions and my understanding will need refinement. Decision Science – at first I thought this term was one into which the others neatly folded. However, having done a bit of research, I can no longer say that’s the case. As I currently understand it, Decision Science concerns itself not so much with the process of making business decisions, but with the psychology of making any kind of decision. In other words, why do people make the decisions they do; what are the factors they take into consideration; how do they weigh them; how emotional are people in reaching decisions, etc. It seems that Decision Science is a relatively new discipline. This conclusion is backed up by the history of its presence in some of the Universities and Colleges in the United States. For instance, Carnegie Mellon University’s Department of Social and Decision Sciences finds its roots in 1976, as part of what is now the Marianna Brown Dietrich College of Humanities and Social Sciences.” The Harvard Decision Science Laboratory opened its doors much more recently. According to their website, they’ve only been around since January of 2009. I couldn’t find the date George Washington University’s Business School’s Department of Decision Sciences opened its doors, but my hunch is it was sometime in the last decade, at most. The Columbia Business School’s Center for Decision Sciences, formerly part of the Institute for Social and Economic Research and Policy, appears to be fairly young as a separate discipline as well. Decision Modeling – Although at best an inexact science, decision modeling can be a highly effective tool in helping an organization better predict the outcomes of its decisions. This is made more likely if the model is comprehensive, based on not merely data and analytics but also the knowledge of the people involved in the organization for which the decision is being made, and if the model is iterative and capable of incorporating newly discovered information and relationships. Furthermore, the structure of the model becomes more and more effective as it accurately models the complex relationships it seeks to help understand. World Modeler™ is capable, despite it’s seemingly simple interface, of modeling highly complex relationships. I’ll post more in the future about its capabilities, including embedding some excellent videos showing what it can do. Decision Engineering – This is a term I don’t believe we are using any longer to explain what Quantellia does. Frankly, as someone who spent over two decades working with aerospace engineers and rocket scientists (quite literally, on the Space Shuttle Main Engine, Delta, and Atlas engine programs), I’m kind of partial to engineering. I can, however, understand how it may sound a bit intimidating or dweeby to people without my background, so I won’t dwell on it here. Decision Intelligence – This is the term Quantellia now uses to describe what it is we do. 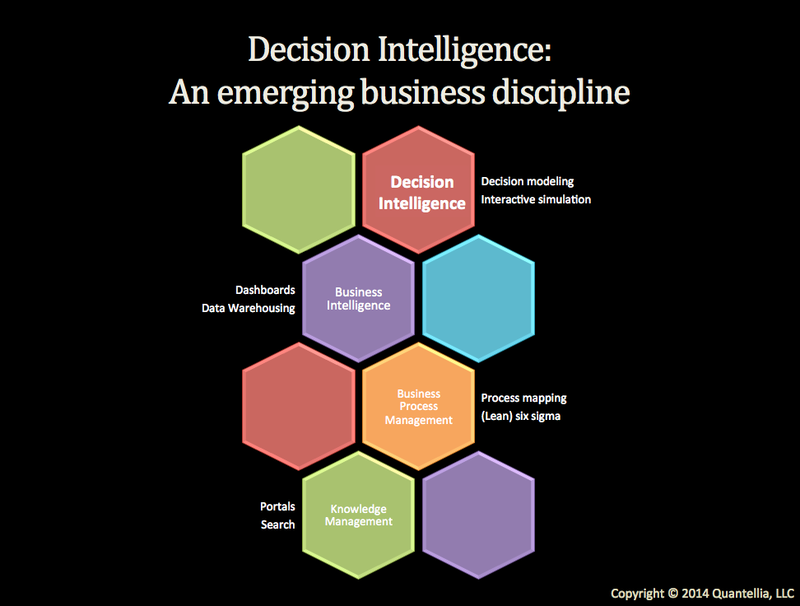 NB – The term is not “Decision Analytics”; there’s a reason for this. Perhaps it is best understood when one looks at a part of how decision modeling is accomplished. Part of the raw material available today for making decisions is what we call “big data”. There’s an awful lot of attention being paid to the field of predictive analytics, which uses big data as its raw material. We at Quantellia prefer the term predictive intelligence. This is because predictive analytics uses past performance (data) to project trends into the future. We like to think we take the concept a bit further. Mild Disclaimer – I hope I didn’t rattle anyone’s cages too much with these definitions/explanations. They represent my current thinking and, being somewhat of a newbie to the science/craft of decision making as a discipline, my understanding is necessarily incomplete and in a state of flux. Nonetheless, this is a first attempt at explaining some of the concepts that are informing my work with Quantellia and World Modeler™. Consider it an ongoing process. At the same time, I would like to make it clear that Quantellia has been doing this for approximately eight years and has a track record of helping organizations both large and small to make decisions and manage programs successfully. Dr. Lorien Pratt, co-founder and Chief Scientist, as well as her team, know their stuff and are the biggest part of my team. We are looking for people who have “wicked problems” they need to solve; people who are facing highly complex decisions involving lots of time and money, and for whom the wrong decision could be very costly. If you fit that description, or know of someone who does, you could do a lot worse than contact us for an initial discussion of your needs. We begin with the end in mind and believe we can help. Only by understanding what it is you face can we determine whether or not that’s possible.